Gary's Catering Service offers the best in business catering and corporate catering in Southeastern Michigan and Metro Detroit, MI area. From Brighton and Grosse Pointe to Ann Arbor and Birmingham, MI and beyond, if it's simply food dropped off in our lunch boxes for employees or an elaborately lunch to dazzle clients, we're the local caterer that can deliver and exceed your expectations. We understand what our corporate customers are looking for because we've learned through 45 years of catering hundreds of corporate and office events from holiday office parties, meetings, and special anniversary events to corporate dinners, seminars, conferences, and luncheon receptions. We succeed by providing our business clients with delicious cuisine, stellar food service custom tailored to your food preferences and prompt delivery. Our chef is classically trained in culinary arts and gourmet food preparation and accepts nothing short of upscale excellence -breakfast, lunch, dinner, inside or outside. Don't have a supplier of party rental equipment and the entertainment? Gary's Catering service can provide anything that you need as your single-source professional party/event caterer. Below you'll find an extensive corporate and business oriented catering menu. Feel free to consult with our executive chef for more information on our corporate/office catering services. High quality disposable plates, utensils, napkins, buffet table coverings, condiments, chafing dishes, sterno, serving utensils. (additional fee may be applicable for extended drive time, please inquire). 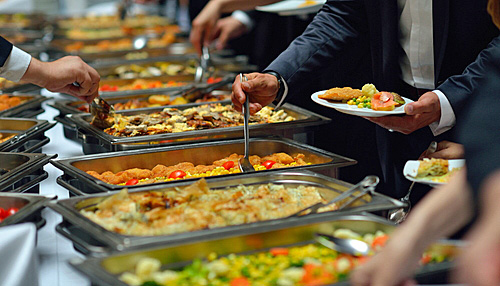 *Beside a selection: We recommend our Full Service Buffet for Office and Corporate Events: Featuring catering wait staff on premise to tend to guests needs, buffet setup & maintenance, food area cleanup. Consuming raw or undercooked meats, poultry, seafood, shellfish, or eggs may increase your risk of food borne illness, especially if you have a medical condition. *Asterisked items are served raw, or undercooked; contain or may contain ray our under cooked ingredients; or may be requested undercooked; or can be cooked to order. Thank you for considering Gary's Catering! West Bloomfield, Michigan Corporate, Business, Office Caterer, Office Party Catering, Bloomfield Hills, MI Corporate Caterers, Wixom, Novi, MI Corporate Catering Services, Livonia, Canton Office Party Catering, MI Business Catering Services, Westland, Wayne, Detroit, Dearborn, Dearborn Heights, Michigan, Wyandotte, Auburn Hills, MI Troy, MI Corporate Caterers, South Lyon, Milford, Plymouth Business Catering Services, Northville, MI, Ypsilanti, Redford, Farmington Hills Office Party Catering, Canton, MI Corporate Dinner Caterers, Commerce, Royal Oak, Michigan, Birmingham, Upscale Restaurant Quality Catering in Farmington, Michigan, Ann Arbor Corporate Event Catering Services, Dexter, Pinckney, Brighton, MI Corporate Meeting Catering Service, Howell, Hartland, Fenton, MI, Flint, Southfield Corporate Catering Services, Belleville, Rochester Corporate Reception Caterers, Michigan, Ferndale, Corporate Seminar Catering Services, Rochester Hills, Michigan, Gourmet Bloomfield Hills Corporate Catering Services, Clarkston, Waterford, Bingham Farms, MI, Taylor, Saline, Brighton Business Party/Reception Caterers, Lapeer, MI, Sterling Heights Office Party Caterers, Warren, St. Clair Shores, MI, Eastpointe, Harper Woods, Grosse Pointe Office Party Catering Services, Grosse Pointe Farms, Roseville, Clinton Township, MI Corporate Catering Service, Shelby Township, Beverly Hills, Trenton, Downriver, Jackson, Lansing, MI Corporate Catering, Michigan, Metro Detroit Corporate Catering Services, Oakland County, MI Corporate/Business Catering Service, Wayne, Macomb, Livingston County, MI Business Catering Services, Washtenaw, Genesee, St. Clair, and Ingham County. Corporate Conference Caterers, Business Meeting Catering Services, Michigan Local Affordable Office Catering, Holiday, Office Catering for Seminars and Conferences.